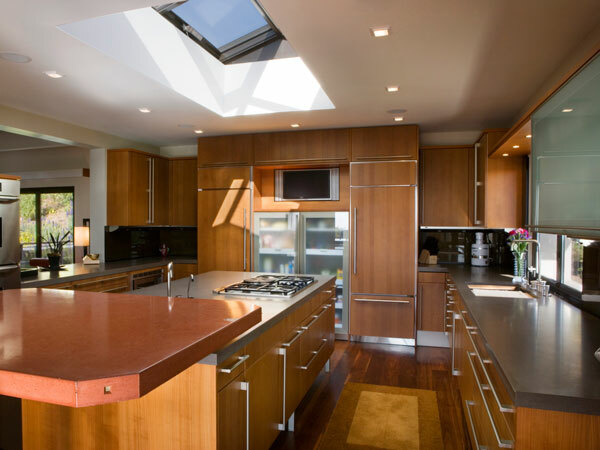 Ecofriendly ways for a greener kitchen ! - iRenovate Interior Designers in Delhi Rated 4.3 / 5 based on 211 customer reviews. The eco-friendly kitchen begins with eating green, but it doesn’t end there.Making the right choices for your well-being is good for the pocket and the planet. Try incorporating some of the following eco-savvy ideas into your life in the kitchen, and see how good it feels to go a little greener. Choose cookware and utensils that stand the test of time and won’t have to be thrown away . Go for stainless steel or cast iron instead. Choose sturdy utensils rather than cheap ones. Buy high-quality knives . An efficient dishwasher, for instance, can use a lot less water than washing the dishes by hand in the sink. When you replace your old-faithfuls look for the energy star rating, available for kitchen appliances including stoves, refrigerators, freezers, and dishwashers, then choose a sturdy model that will last and choose a simple design . On average, the kitchen generates the most waste of any room in your house. Refuse excessive packaging by taking your own bags, buying fresh. Reuse what you can, like old glass jars or bottles, grocery bags, and packaging you can’t avoid. Compost any uncooked organic waste including cardboard and paper. It’s comeback time for linoleum. It is made of renewable, biodegradable materials, linoleum is getting a second wind from consumers who want eco-friendly flooring in their kitchens or bathrooms. Linoleum is also resilient and easy to clean, making it longer lasting than some of the less eco-friendly flooring options. It’s tough to think about conserving water when you’ve got loads of filthy dishes that need a good scrubbing. But cutting back on water consumption is one of the easiest ways to make a kitchen more energy efficient.Get in the habit of conserving water when doing the dishes by filling up a basin (or one side of the sink) with soapy dishwater. Instead of letting the water run continuously when washing, do them all first and then rinse. If you have to use a dishwasher, use it only for full loads to conserve as much water as possible. One green lighting strategy is to place several lights around the kitchen and install different switches for each of them. That way, you can choose which lights you need at which times. It’s also smart to install dimmers or motion sensors on lights. Both options cut down on unnecessary usage and cut costs.The most affordable, eco-friendly bulbs are fluorescent, which use as much as 90 percent less energy than traditional incandescent lighting (which is being phased out ). If you really want to go green, it’s time to rethink your plastic consumption and start cutting down on the amount of plastic you use. Cutting down on your plastic consumption is a huge commitment, but can be done. You can start by avoiding items that are packaged in plastic. For all the things you buy that are packaged in plastic, there are usually alternatives that can be found in glass, metal, or cardboard. Whether you’re cooking on a gas or an electric stove, we use a lot of energy when we cook. One pot boils water, a pan sautés veggies, another pot cooks rice, and dessert is in the oven. As long as we’re cooking and baking we’re consuming energy. Putting a lid on pots and pans when you cook will save the amount of time it takes to cook them, and therefore use less energy. Water boils faster with a lid, and food cooks faster with a lid on the pot or pan. Try turning the heat off a few minutes before what you’re cooking is done. The pot or pan will be warm enough to continue cooking the food thoroughly, and you’ll save a few minutes’ worth of unrenewable energy. While it may not seem like much, it adds up, and makes a big difference in your energy consumption. Taking your eco-conscious actions a step further by adopting some of these habits in the kitchen is an excellent way to do more.